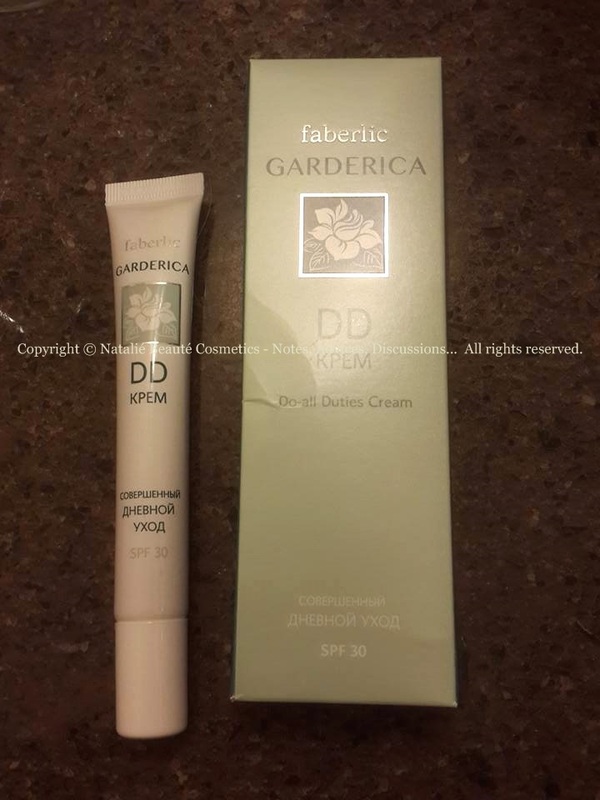 DD Cream from the line GARDERICA by faberlic, is positioned as "perfect day skincare" with SPF 30. "Multiactive universal high-tech cream for those who wish to achieve maximum effect with one product. 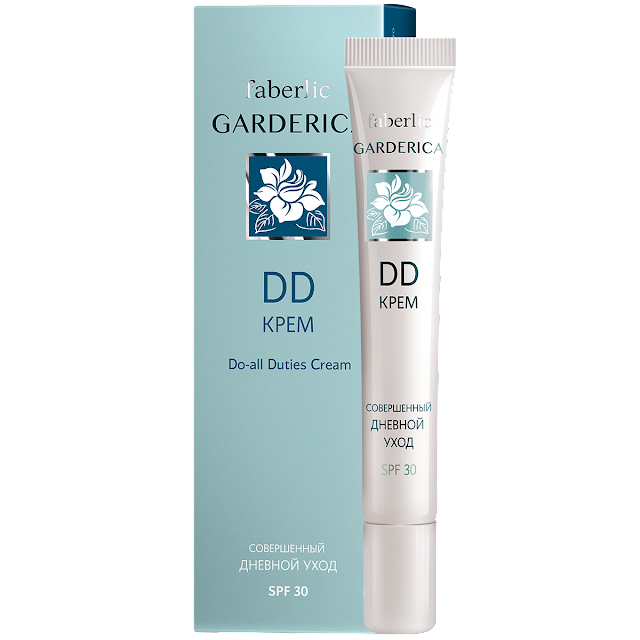 Only 8 magic drops of DD-Cream applied onto your face transform your skin in just a few seconds and for the whole day. 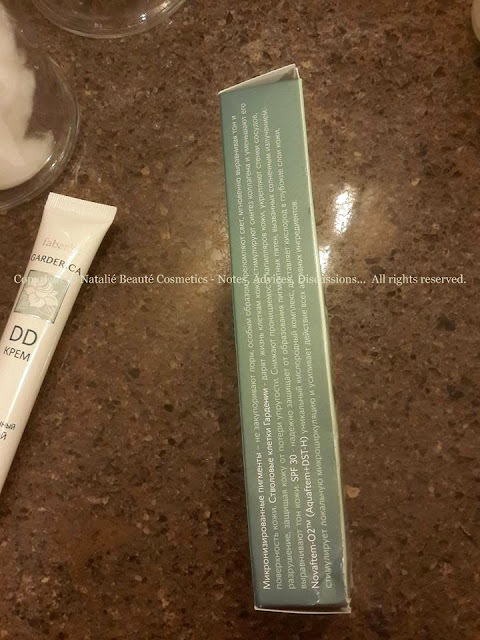 Innovative texture of DD-Cream spreads easily, does not block the pores, and is suitable for all skin types. Tube with special nozzle for convenient application and economic use. Micronised pigments do not block pores, refract the light, instantly smooth skin tone. Gardenia stem cells revitalise skin cells, stimulate synthesis of collagen and reduce its destruction protecting firmness of the skin. 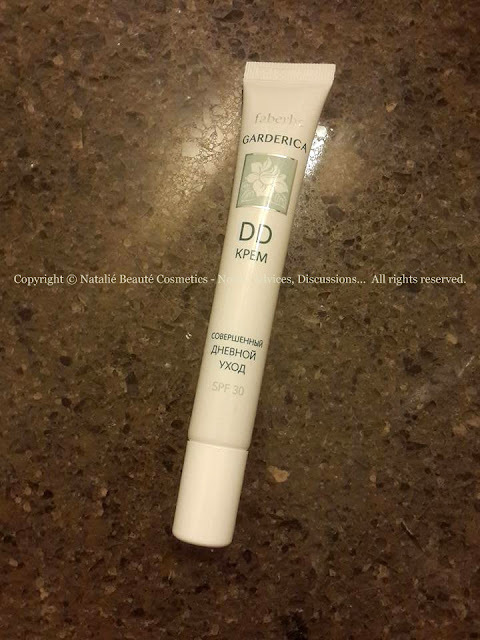 Reduce transparency of skin capillaries, strengthen walls of blood vessels, smooth skin tone. SPF 30 protects the skin from pigmentation caused by UV rays. Novaftem-O2™ (Aquaftem+DST-H) is a unique oxygen complex which delivers oxygen into deep layers of the skin and stimulates local microcirculation enhancing action of other ingredients." 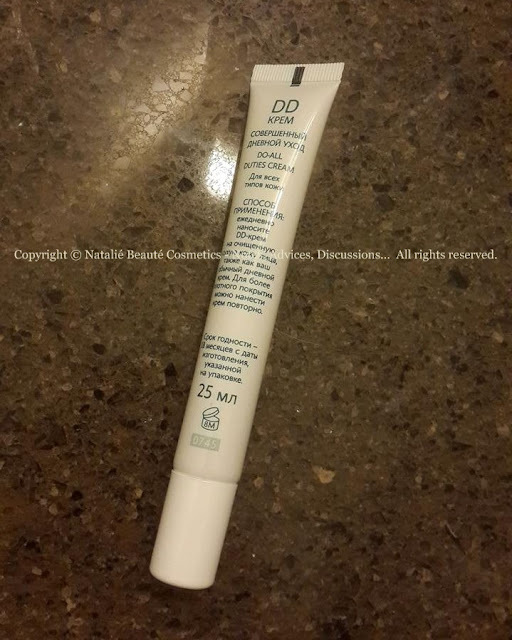 This product is kind a tinted moisturizing cream, the same time - something between day cream and foundation with very light coverage (applied second time, can get more coverage). 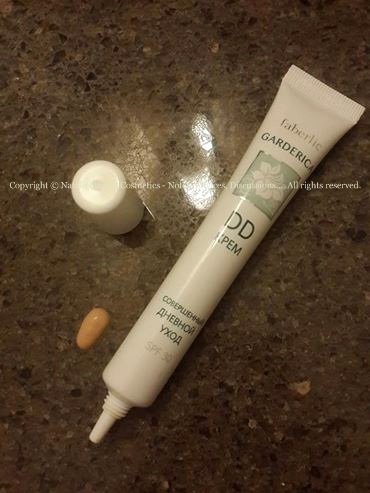 This DD Cream is very smooth and easy to apply. It blends very well on the skin. It has high color adaptation and instantly soothes the skin. You feel your skin calm, soft, well nourished for hours. It doesn't add artificial glow effect. It gives very natural appearance. Your skin feels extremely comforted and very delicately, beautifully scented. It's one very useful and pleasant product. aqua, cyclopentasiloxane, ethylhexyl metoxycinnamate, c12-15 alkyl benzoate, caprylic/capric triglyceride, titanium dioxide, glyceryl stearate, ethylhexyl triazone, cetyl esters, tridecyl salicylate, peg-100 stearate, butylene glycol, aluminum starch octenylsuccinate, mica, steareth-2, isopropyl isostearate, cetyl alcohol, beeswax, magnesium aluminum silicate, isopropyl myristate, hydrogenated palm kernel sodium cocoyl alaninate, caprylyl methicone, hydrogenated palm glycerides, aluminum hydroxide, dimethicone/methicone copolymer, lecithin, tocopheryl acetate, arginine, gardenia jasminoides meristemcell culture, panthenol, perfluorodecalin, xanthan gum, poloxamer 188, sodium dextran sulfate, perfluoropolymethylisopropyl ether, iron oxides, bht, caprylyl glycol, disodium edta, ethylhexylglycerin, glycerin, phenoxyethanol, fragrance, alpha isomethyl ionone, hydroxyisohexyl 3-cyclohexene carboxaldehyd, hydroxycitronellal, benzyl salicylate, citronellol, cinnamyl alcohol, limonene. The product comes in Paper box, non-nylon sealed. The tube is plastic. There is a conical applicator. 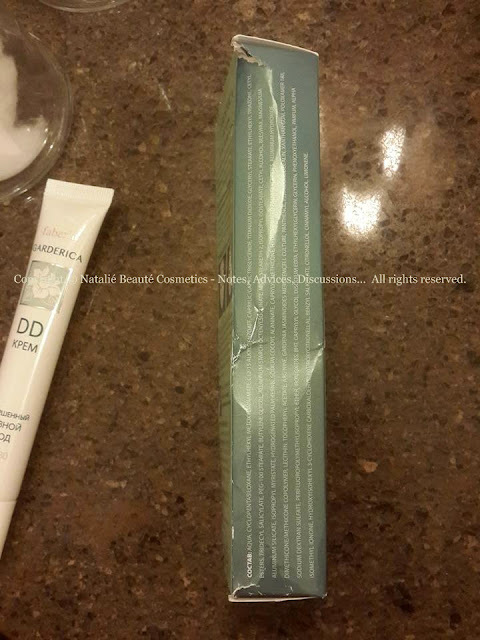 The package came already damaged. Because of the documental character of my photos and reviews, I'm always trying to show the actual look of the products - the way they really look like, the way they came in the order, etc. Seems, that the managers on duty, are trying to give the smallest possible box for each order. That's why, if there is not enough place inside, they just don't put your 5 or 10 catalogues, in the box. Neither, sending you them with the next order! This is one big "-", which happened with some of my orders already several times. The product stays for hours on your skin, without to oxidize, without to gathers in the fine wrinkles. There is no mask effect, no cacky effect, no sticky residue. The skin isn't panting for air, under the cream. The product takes care for your skin, while beautifies you. 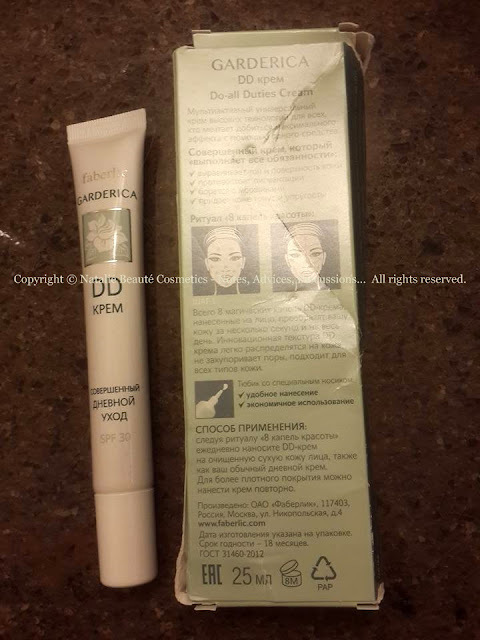 It gives you very natural look, very healthy skin look and adds additional charm to your appearance.